 Advantageous square flatbed is ideal for variety of users. 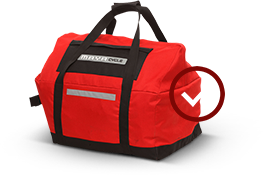 transports your cooler, two cases of beer, large square countainers, or the FREE custom water resistant bag filled with cargo. "Let Maya Cycle carry the weight of your day!" Handy wheelbarrow conversion allows you to transport even heavy loads comfortably and conveniently with your own two hands. Leave your bike locked and wheel the trailer where needed. Voila. Parking? easy. Maya Cycle's efficient kickstand props bike and trailer solidly upright for any necessary stops as well as loading and uploading. Light, narrow, in-line design allows the trailer to glide easily behind you along sharp turns, around pedestrians, curbs and obstacles. Carries up to 66 pounds with no fishtailing effects. Brilliant! Maya Cycle – The Best Bike Trailer! Maya Cycle is the best bike trailer with a kickstand that holds your bike and trailer upright, and converts into a wheelbarrow so you can easily move your heavy cargo. Designed and built for city streets, rides to the beach, camping getaways, cross-country touring, and any other type of cycling adventure you would like to experience absolutely hassle-free. With Maya Cycle’s unique design, you’ll bike ride through your day and never worry about thin bike paths, tight corners, pedestrians, or anything else that may come as close to you and your bike as a street side curb. 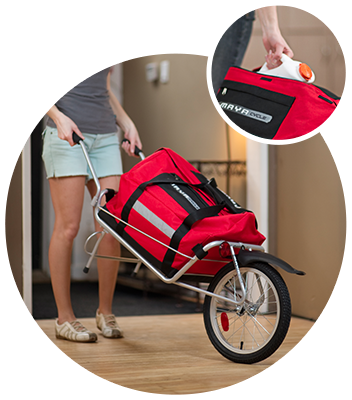 With the Maya Cycle bike trailer, you can bring what you want, when you need it. 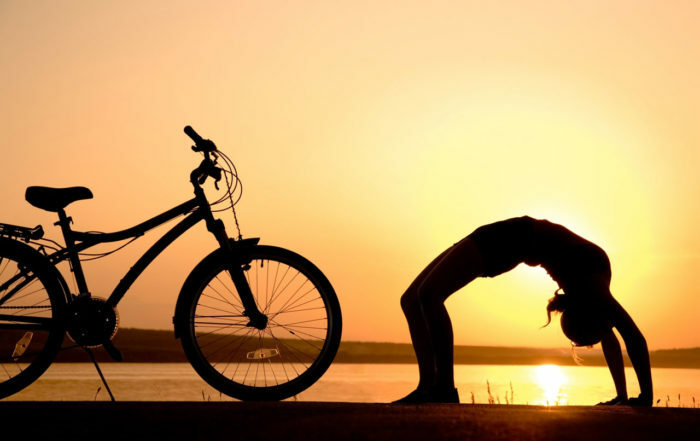 Take the load off your back and let Maya Cycle carry the weight of your day! 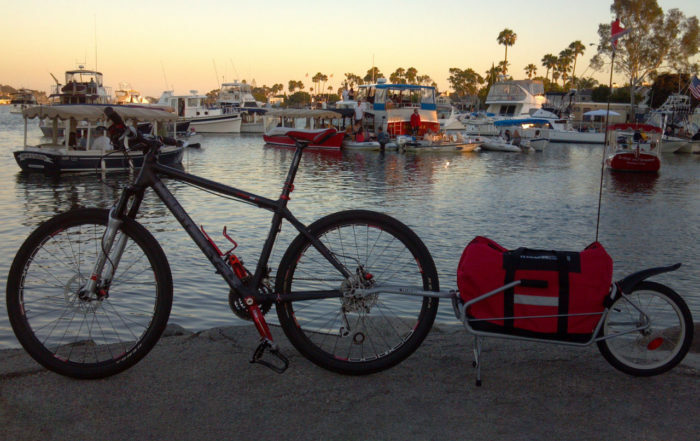 The Maya Cycle has reached my expectations as a bike trailer and exceeded my expectations as a beer carrier! I’m impressed, thank you! Spacious. Square flatbed is perfectly sized for your cooler; camping gear; a couple cases of beer; a large square container; a recycling bin; or of course, the FREE custom water-resistant bag. Light. Under 13 lbs (5.9 kg) total weight. You won’t feel the bike trailer behind you. Durable. 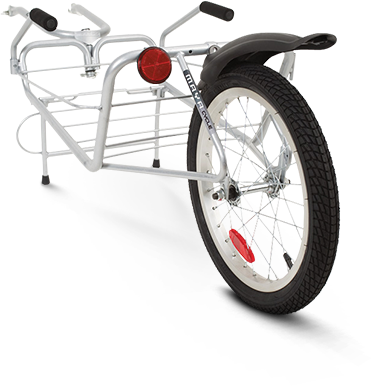 Every Maya Cycle bike trailer is tested for quality and proper function. Flexible. Tubular steel flexes to absorb shock when off-roading. Precise. The 16” wheel follows directly behind your bike tires. Strong. Easily carries up to 66 lbs (30 kg). Generous. Use with or without panniers and/or bike racks. Visible. Reflective stripes are located on the bike trailer bag and flag. Watch out for unauthorized copies! and Experience Why They Love It so Much! Just wanted to tell you that I completed my 400 km trip of dirt trails through the mountains of central British Columbia with my Maya Cycle and that I am really happy with the handling and performance of the trailer.I was able to fit everything (tent, sleeping bag, air mattress, food, cookware, clothing and spare parts) at about 25 kg. Most of the time I could hardly feel it behind me. This is the best bike trailer, got lots of compliments. Look forward to using it again. Thanks!! My goodness. When I first used the original quick release, the fork came undone several times when it wasn’t fascined properly… I could only imagine what could’ve happened.. But this is a fool proof assembly. Easy on, easy off. No nonsense and it seems very secure. Maya, I lost my camera on a recent bike trip and was hoping to find it and all the pics I took.The trailer is awesome! I have used it to haul groceries, bricks for a flower garden, tools to jobs, fishing trips and camping trips. It is by far the best trailer of the 3 I have owned! Never even feel it behind me when I go riding and lots of people stop me to ask about it (possible commission on sales? lol). I definitely recommend it to anyone who needs a cargo trailer and thanks for giving me one. Will most likely be buying one later this year for my girlfriend so we can go camping together. Have a great day! I have been using the Maya Cycle bike trailer and so far I think it is terrific. I have not loaded it with anything substantial, but what I like is that I hardly even know it is there. It rides smoothly and quietly, and follows perfectly around bends as tight as 5 ft radius. The only way I notice its presence is going over bumps or curbs… as expected there is a third “clunk”. There were 2 small “design deficiencies” associated with water puddles and mud that I wanted to improve on. I thought you might be interested in my solutions. So far I love the Maya Cycle, I use it all the time for school. I’m a teacher and I can bring some of the marking home in it. Very handy. My wife found it by watching Dragon’s Den and ordered it for me. Maya Cycle Bag – custom designed, water resistant – included FREE!